Home Adventures White Mountain – The Biggest Climb in the USA? 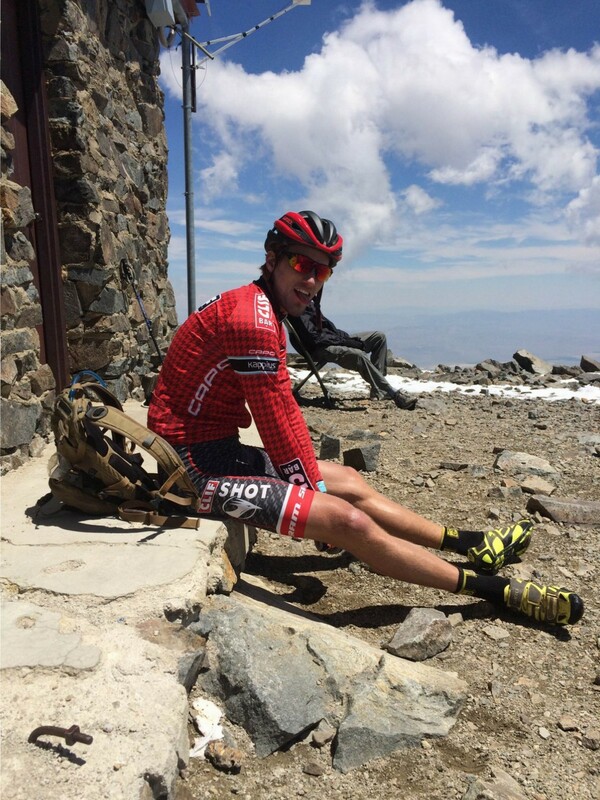 White Mountain – The Biggest Climb in the USA? After a failed attempt three years ago, B-Funk and I returned to conquer White Mountain Peak via Silver Canyon. 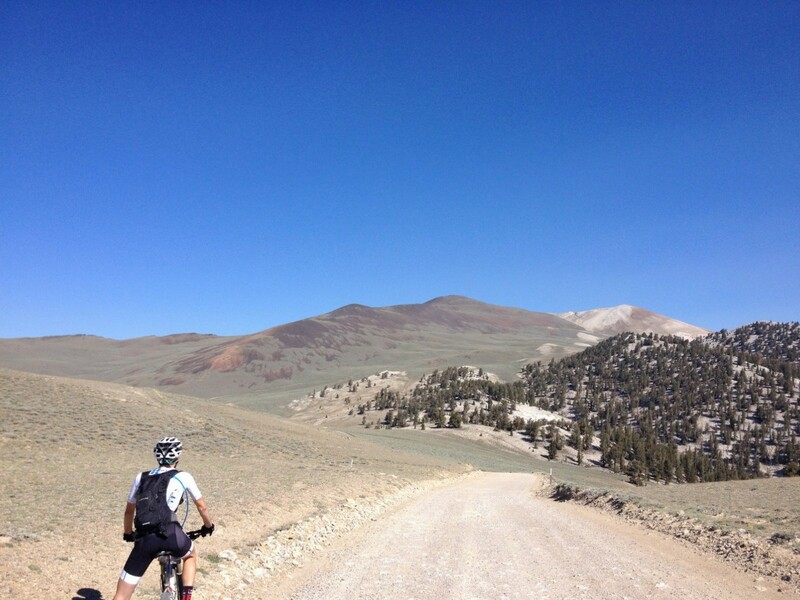 Climbing from 4000′ to the third highest peak in California at over 14,000′, this all day mega-epic is likely the longest dirt climb accessible to mountain bikers in the contiguous United States. 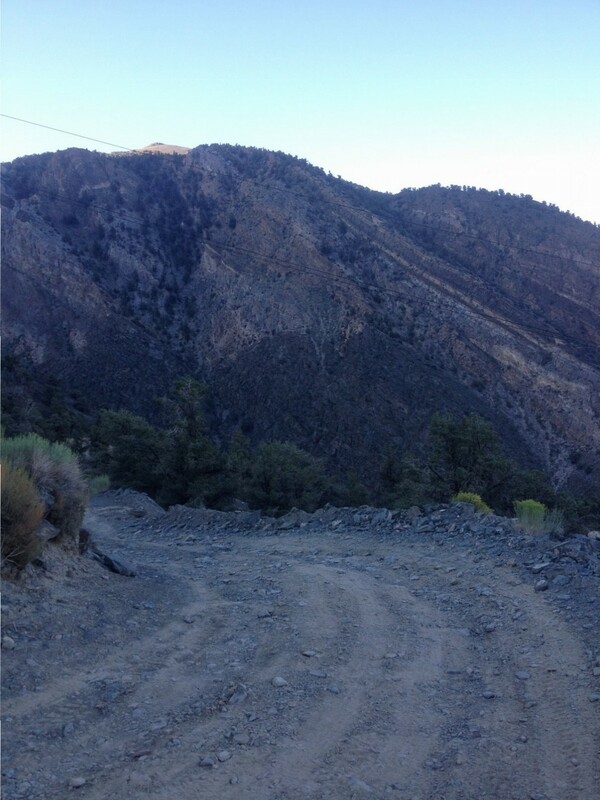 Back in 2012, my college roommate Brian and I hatched a plan to do what we believe to be the biggest dirt climb in the lower forty eight: White Mountain Peak via Silver Canyon Road out of Bishop, CA. 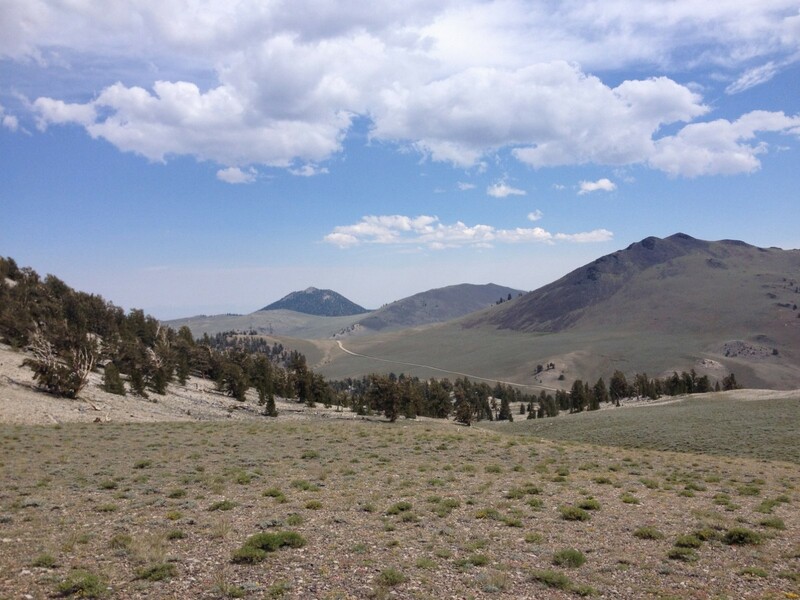 White Mountain is the third tallest peak in California at 14,252'. Mt Whitney is higher and only a short distance away, but is not accessible by bike. Unfortunately we had to turn around that day in September when my freehub stripped out as I climbed the steepest part of Silver Canyon. Fast forward to 2015, and I called the temporarily fun-employed Funky-town, and gave him four days notice to get his Geo Metro to Bishop and attempt the climb again. I had just competed at the Downieville Classic with decent results, so the attempt was to be on the Monday after on my way home from Tahoe. 4am was a really early wake up following two days of hard racing, but we got rolling by 5am in order to make it up the steep Silver Canyon Road before the sun was on us. 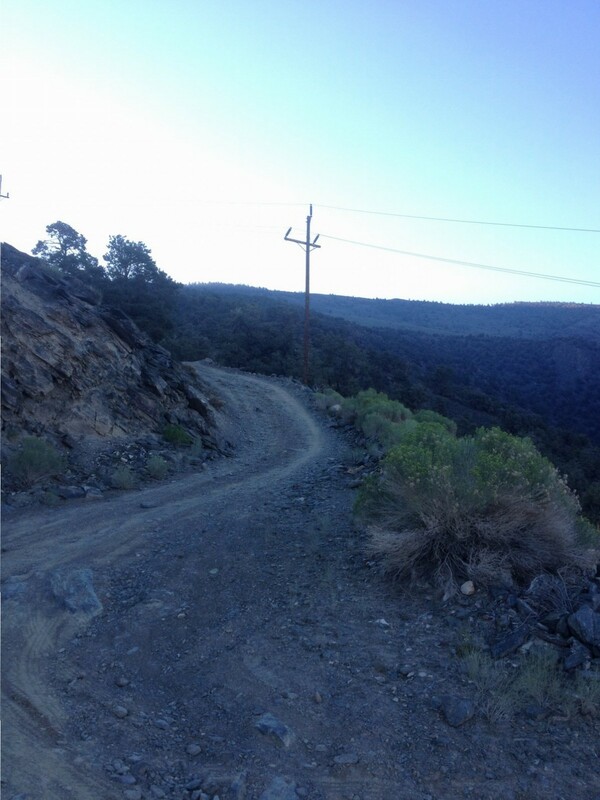 Silver Canyon Road climbs a wash from Bishop (elev 4,200') at a "gentle" 5-10% for the first 7 miles and 3000 feet vertical, before pitching upward for 4 horrendous miles of 20% switchback ascending to 10,400'. Crisis almost struck just three miles in, when Funk shifted over the top of his cassette and nearly tore his derailleur off. He saved it and reset his limit screws, and we were on our way. The plan for the day was to keep it slow with as little effort as possible, which is hard to do without a lot of walking. I was on my Downieville race setup, an RIP9 RDO, and only had a 32t chainring to work with. Next time I will use a 28t, except that this was a once in a lifetime ride and there won't be a next time. We were each carrying about 160 ounces of fluids- for me a full 100oz Camelbak, a bottle of 3x concentrated electrolyte to sip on the whole day, and a 33oz plastic soda bottle I filled with water and shoved in my backpack pocket. There are no refilling points on the whole ride, so the key was to keep exertion low enough that we were never dripping in sweat. At times this meant walking. 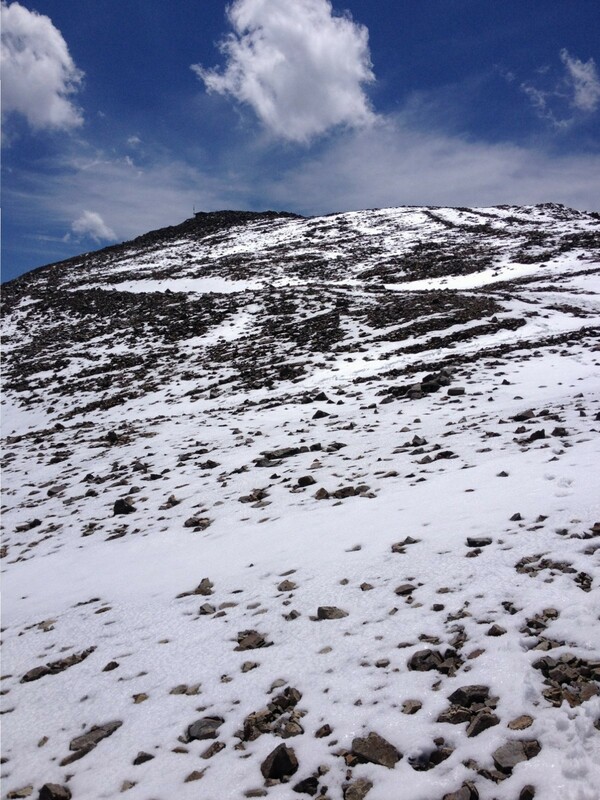 Over three hours after we started, the sun was on us, but it was a cool 70 degrees at 10,400'. Reaching the ridge after all that walking and 30 rpm leg presses was a joyous occasion. 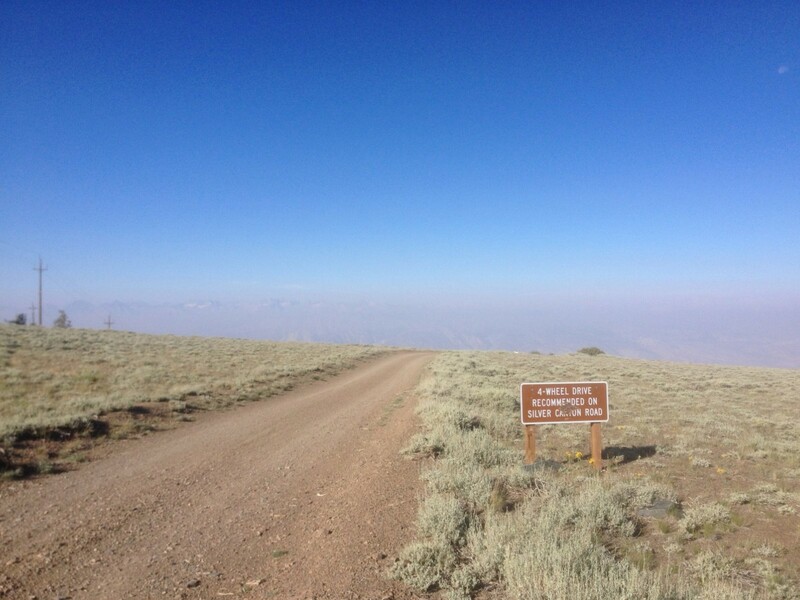 Smoke from forest fires filled the Owens Valley, so the high peaks of the Sierras were only barely visible. At this point, I ditched my 33oz of extra water in some bushes to be picked up on the return. 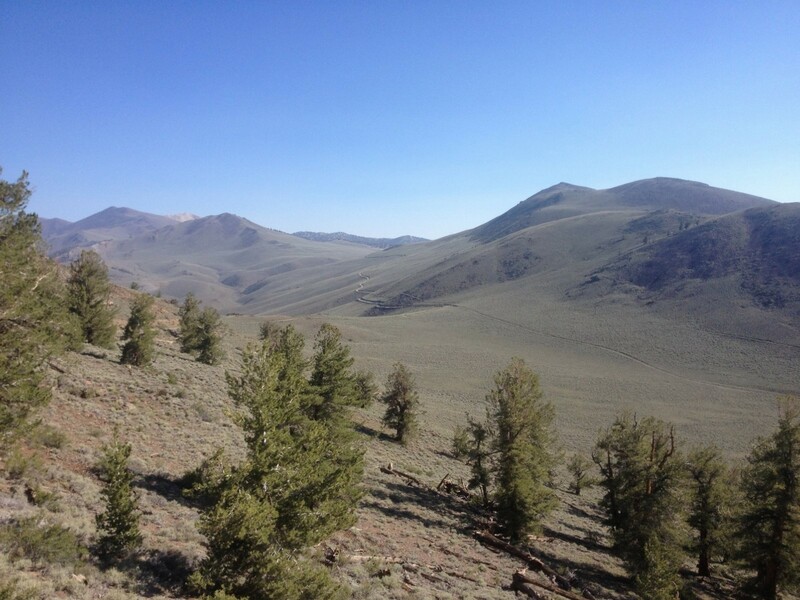 The ridge road was an extremely pleasant grade compared to Silver Canyon, though it did not climb continuously. Every descent was a kick in the balls, since we knew it meant we weren't making vertical progress towards the peak and also that we'd have to climb it on the way back. 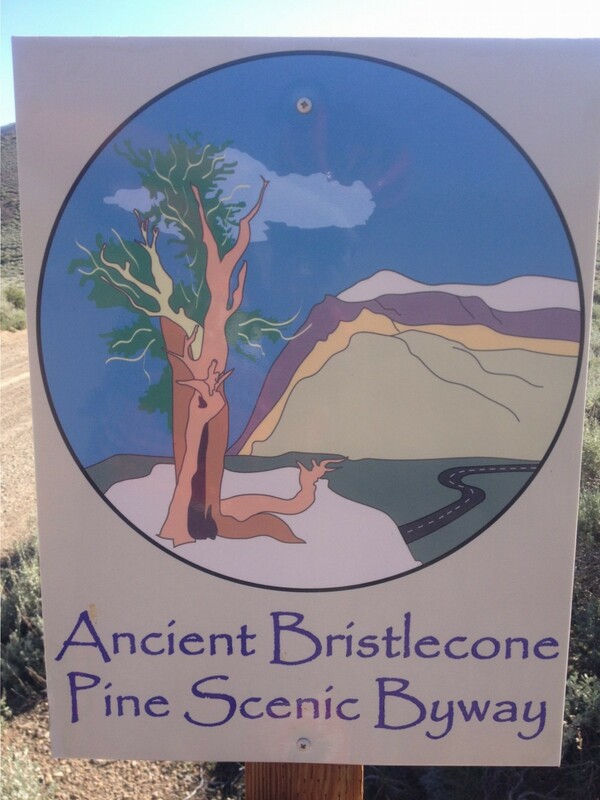 Doing this ride in a single day is probably impossible for most people, but it is possible to instead drive up Highway 168 and turn on the dirt Ancient Bristlecone Pine Scenic Byway. It's a well graded dirt road passable by low clearance 2WD vehicles in dry weather. You can park and start biking anywhere along it, or be masochistic and climb Silver Canyon and have someone drive up and meet you with camping gear or at least more food and water. Since I was coming from Downieville, I had my all-mountain race bike. 27 pounds, 5" travel, 140mm Pike, RIP9 RDO, with some large-ish 2.35 tires. Had I been coming straight from home, I would have brought the Jet9 xc bike, but in the end the extra meat was nice for traction on the way up and comfort on the descent. 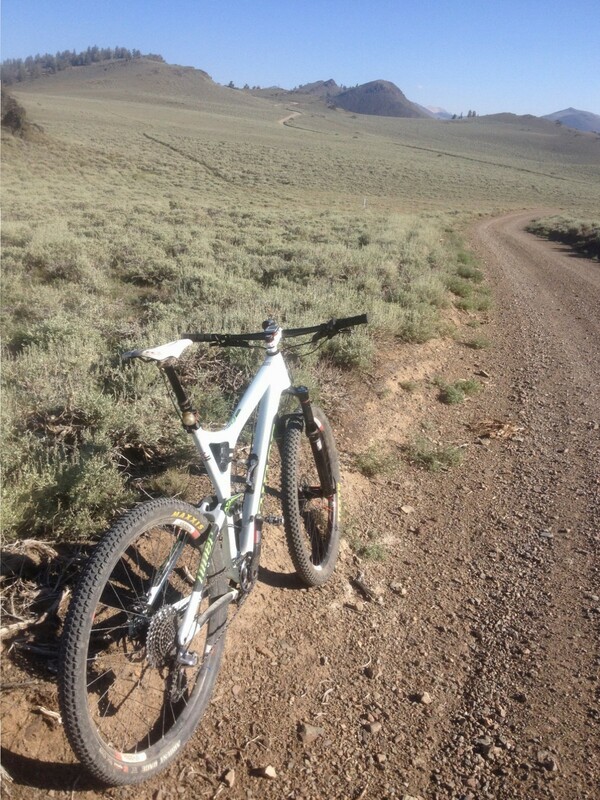 Funk was on his Ti Motorbacon hardtail, which wasn't nearly as pleasant on the washboard roads. Scraggly pines dotted the hillside at 11,000', where the first intermediate descent began. The sun was really beating down on us at this altitude, but I slathered myself with Doc's pro-lifeguard grade sunblock before we started the ride and had a nice pasty armor protecting me. That stuff is so resilient that even after this twelve hour ride and a dip in the Owens River after, the checkout guy at Trader Joe's the next morning asked me "how the surf was looking" because he noticed sunscreen on my arms. Around 10am, the first of about six cars started passing us. 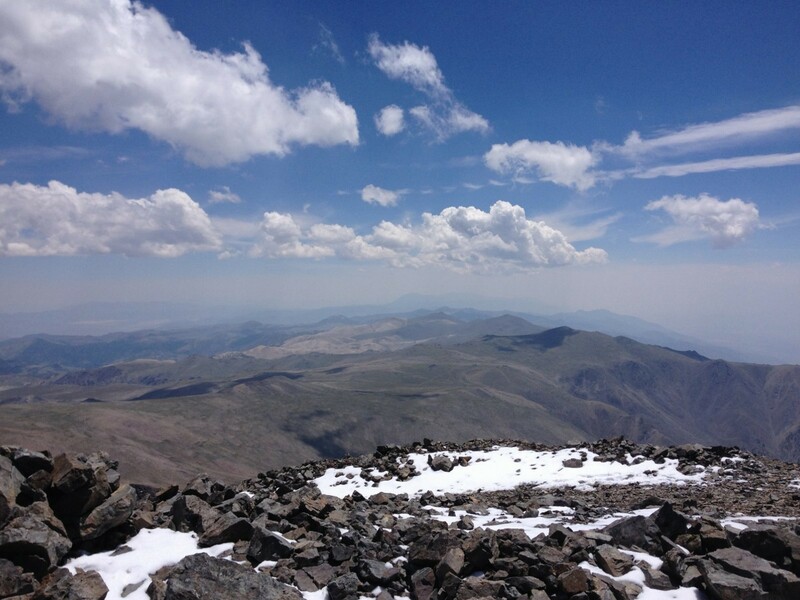 Thanks to the road access to almost 12,000' and lack of required permits, White Mountain Peak is the most accessible fourteener in California, and even on a Monday there were some folks driving out to the locked gate 7 miles from the summit to hike the rest of the way. 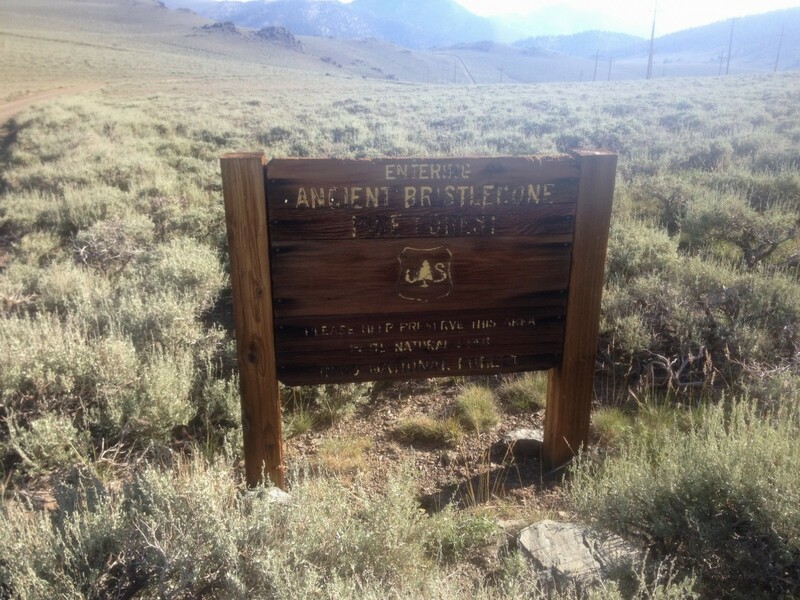 After the initial heinous 11 mile climb to the Bristlecone Byway, 21 miles of rolling ridge faced us to the north. White Mountain wasn't even visible until the final twelve miles, with several 12k+ peaks blocking the view of our goal. We stopped judiciously for nature breaks, sandwich breaks, pickle brakes, Clif bar breaks, and photo breaks. A KOM hammerfest this was not. The final 3,000' ascent was the hardest thing I have ever done on a bike. Past the final locked gate before the University of California Barcroft Research Station, the road became a jumble of loose rock. The thousands of vert already in our legs and rapidly decreasing oxygen compounded to make riding the technical climbs a true test of skill and composure. Recent thundershowers had dumped 4-6 inches of snow on the summit, so with half a mile to go we had no choice but to ditch the bikes and continue on foot. 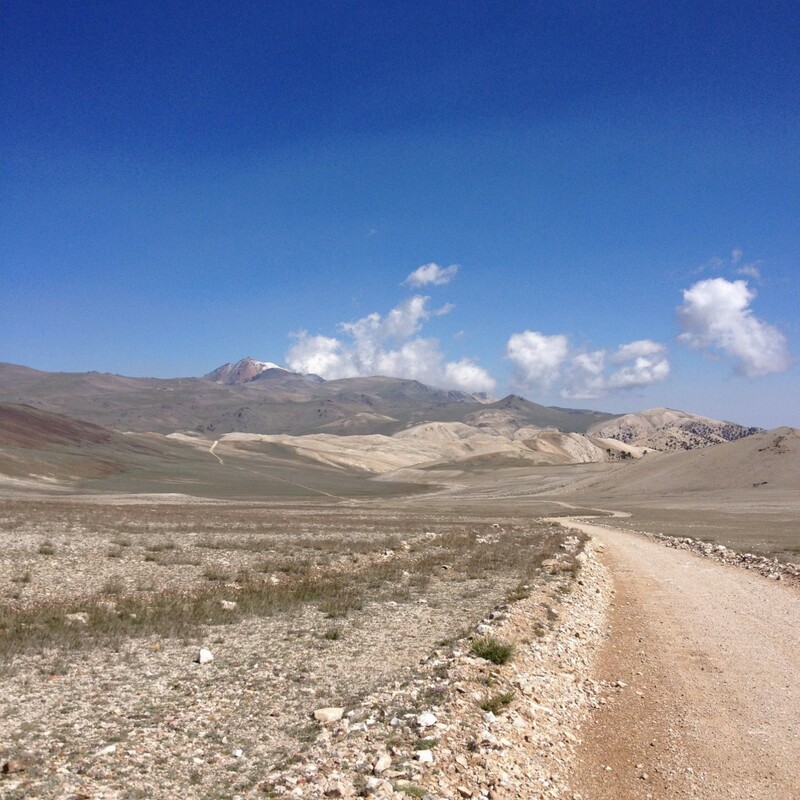 Altitude sickness was taking hold as we solemnly trudged over loose rock and melting snow in stiff cycling shoes. Seeing that much snow in August was an odd experience. Eight hours and fifteen minutes after our 5am departure, the summit was attained! In retrospect, the thirty minutes we spent eating, taking pictures, and questioning our sanity was twenty five minute too long. 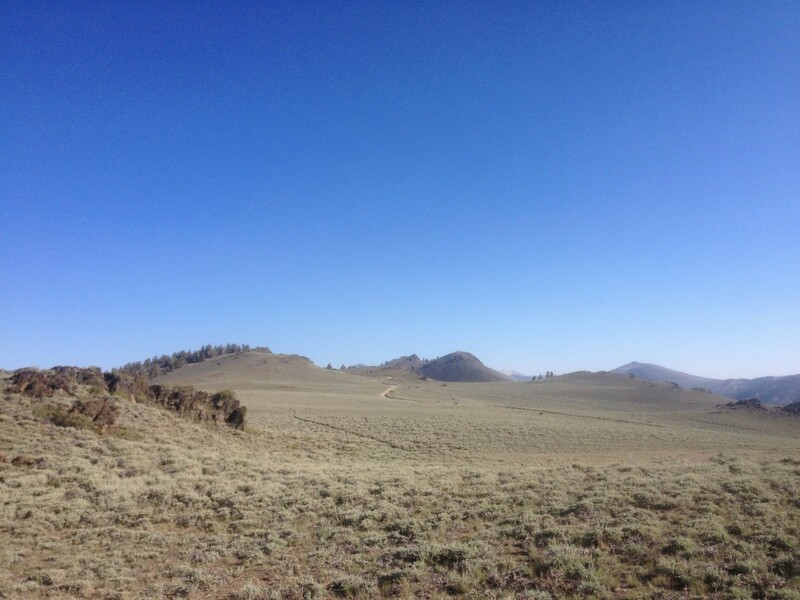 The effort and altitude manifested as splitting headaches that wouldn't subside until we got back near 10,000'. Nausea and headaches aren't a good feeling when faced with 10,000' of fairly technical descending. But the descent ended up being a ton of fun, for me at least. With Funk safely descending on his hardtail and me on the Downieville race rig, I was able to blast ahead, enjoy myself, and stop for some pictures. I've never seen so many marmots in one place. Dozens and dozens of them were running all over the rocky tundra, basically behaving like the big fat squirrels that they are. At this point, I began to regret leaving my spare water bottle all the way at the top of Silver Canyon. My camelbak was empty, so I made a disgusting yet nutritionally miraculous concoction by pouring all the remaining pickle juice into my concentrated electrolyte bottle. I had about 12 ounces of spicy salty sea water to get me fifteen miles back to my stash. By mile 45, there was no power at all left in our legs. On the return, we opted to take Wyman Canyon Road for the final four miles, skipping the 800' climb back up what was the first intermediate descent, instead descending about 400' and then climbing back up to the intersection with Silver Canyon. That final climb felt like ten miles, and the joy when we hit the start of Silver Canyon rivaled that when we had reached the same point from the other direction. 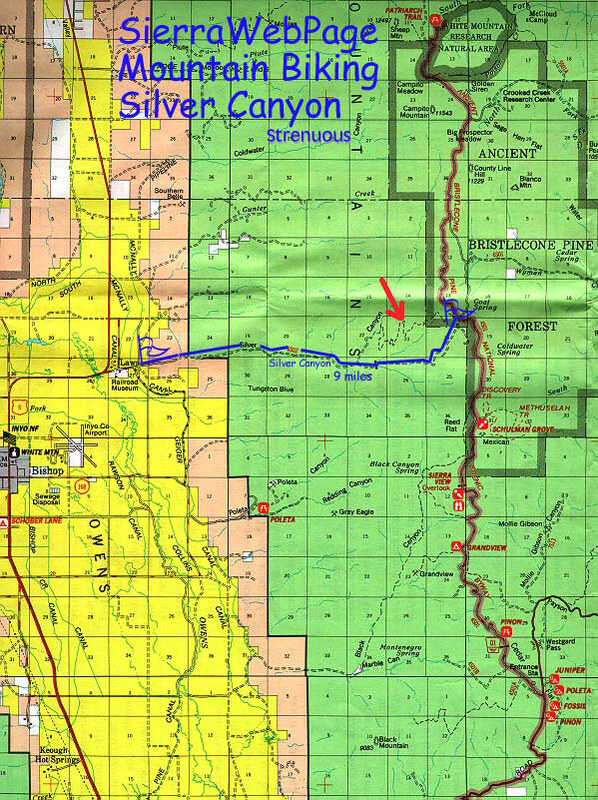 We had discussed taking Old Silver Canyon Road, a rough old road bed indicated by the arrow and dotted line on the map below. 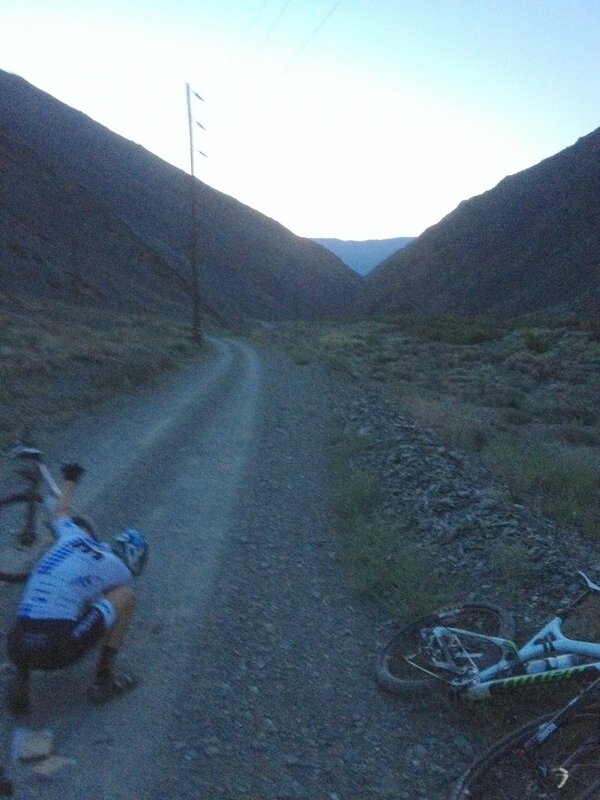 Tired legs and foggy minds nixed the idea of riding more rough stuff, so down we plunged. The true scale of this ride becomes apparent when we realized we still had 6,000' to descend, and not a single pedal stroke was required for any of it. But just over half an hour and two rotor-cooling stops later, we were back in the 100 degree furnace that is the Owens Valley in August, done with the most trying 12 hour day we may ever do. 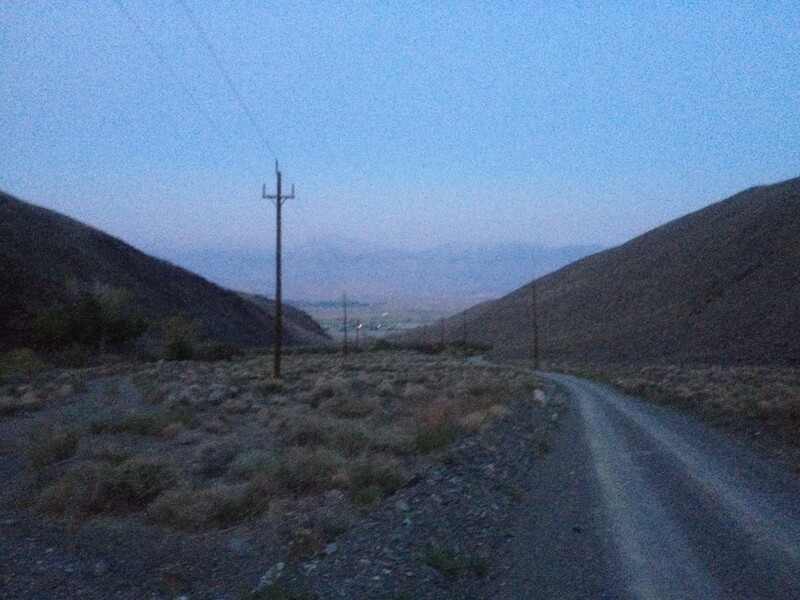 After a dip in the Owens River, Brian and I parted ways and headed home. Brian somehow pushed through and got back to the Bay Area at midnight, but I couldn't drive past 9:30pm, and parked in the desert outside Lancaster and slept straight through the night in the back of my van. I awoke feeling hungover, and then made my way back to SB and my real life. Nice dude. I may do this one again in early September if it’s not too cold on top yet. Used a similar setup to you. Trek Remedy 29 with 2.35 tires. Perfect for all the washboard and great traction on the steepest parts. 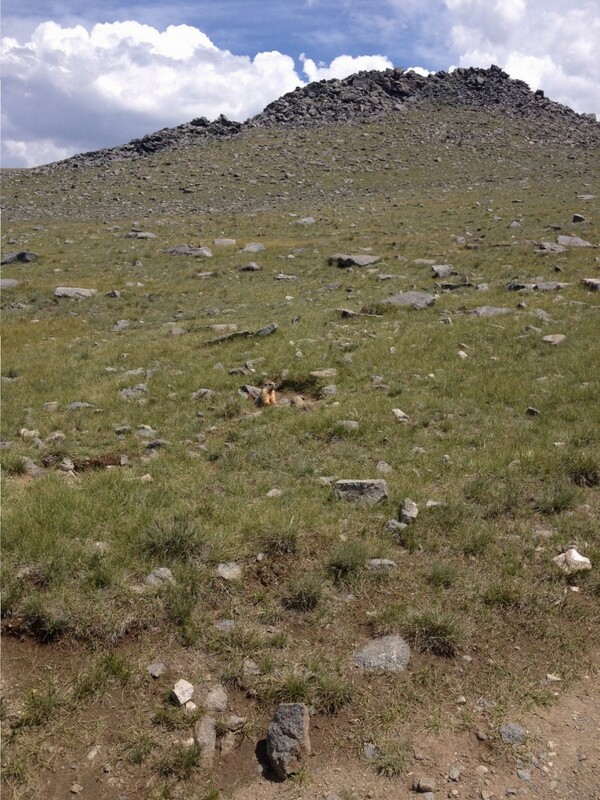 Did you see Campito the horse or the Bighorn sheep herd in Silver Canyon?? ?